Montrose will survive should they drop out of the senior ranks via the play-offs, says chairman Derek Sim. The Angus club, formed in 1879, take on Brora Rangers over two legs after finishing bottom of League Two. If they lose, Montrose would replace Brora in the Highland League. "In the first two years, we have the parachute payment, which would certainly come in handy," Sim told BBC Scotland. "We would certainly ensure that the club would survive." Brora were undefeated on their way to their title and beat Lowland League champions Edinburgh City to set up the tie with Montrose. However, Sim is heartened by an upturn in form for The Gable Endies of late. Montrose finished 10 points adrift at the bottom but picked up two wins and a draw in their final five matches. "There is a little bit of apprehension and yet at the same time we know that the team are preparing well - we are well-organised," said Sim. 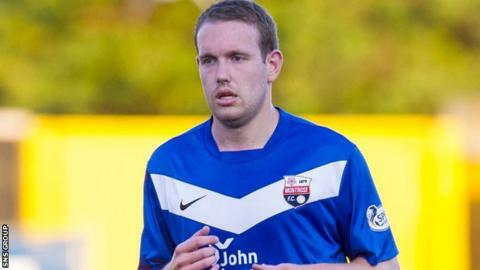 "We are playing a team that are doing very well in the Highland League. "But, providing we do the job this coming Saturday and the following Saturday then we feel reasonably confident we will retain our status in the SPFL." In the event of Brora prevailing, Sim admits Montrose would need to make sweeping changes. "We would have to look at the day-to-day running costs and player location before moving forward in the Highland League," he added. "There are several clubs there who are well-supported by companies and getting back out of the Highland League would be very difficult. "There's no doubt that some of the money being offered in the Highland League is way above what is available in, never mind League Two, even League One." This is the first pyramid play-off and Sim admits to having doubts about the new system. "I think everyone had concerns at the time, especially in League One and League Two," he explained. "We didn't think it had been thought through fully, but the pyramid system was part of a whole package and it was a case of voting for that whole package of reform, which we did. "I think the idea of regionalisation will come up in due course. "If you look at the present time, Brora, (if they win promotion) with the exception of playing against Elgin, all their trips would be beyond Perth and I would imagine some of their players wouldn't fancy travelling from eight o'clock in the morning and not getting back until eight or nine on a Saturday night."